Pros: The importance of keeping the memory alive on the centenary of the end of WWI. Cons: This is a work in progress, which could benefit from the contribution of a dramaturg. Four generations of women pick up the pieces of what was lost during the first World War. When Winifred Lucy Hall died in 1978, her two daughters found a shoebox hidden in her wardrobe, which was full of letters she received from the front during the First World War. She was only 19 when the war ended, and, in the final months of the conflict she had lost both her brother Alvin and her beloved fiancé Bob. Neither of her daughters were aware of those letters and Lucy had never mentioned them to anyone, nor spoken much about her life during that period. 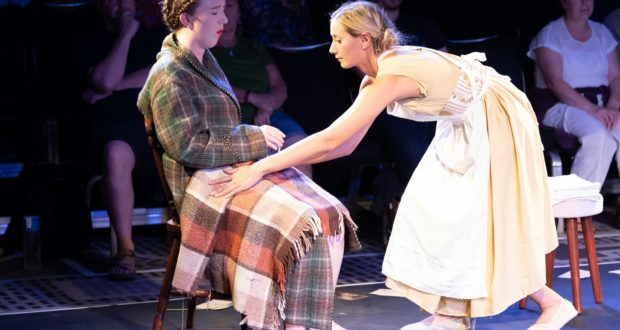 Dear Lucy… celebrates the courage of all those women who remained at home whilst their men fought in the war, and often had the painful duty of picking up the pieces of wrecked families and broken hopes. 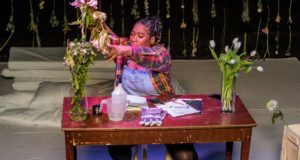 A story that involves four generations of women, with writer and director Carrie Bird being Lucy’s granddaughter and two of the performers on stage, Rachel Bird and Tamara Roberts, being the main character’s great granddaughters. The performance, played in the round, starts with three girls (Sophie Hatton, Maria Michopoulou and Hazel Monaghan) standing on stage, wearing military uniforms. 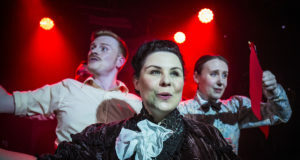 They impersonate Alvin, Bob and the Reverend’s son, Oliver Lampard, whilst a dancer (Tamara Roberts) drifts around them and delivers envelopes into their hands. Snippets of these letters are read aloud, belonging to originals written between 1914 and 1918 by Alvin, Bob and Oliver, as well as other men who enlisted. Growing in intensity, the scene culminates in a very last note addressed to Lucy, which announces the killing in action of her dear correspondents and praises their heroism. Often, this was the only thing families received back, in relation to their loved ones at the front; no personal belongings and no body to bury. 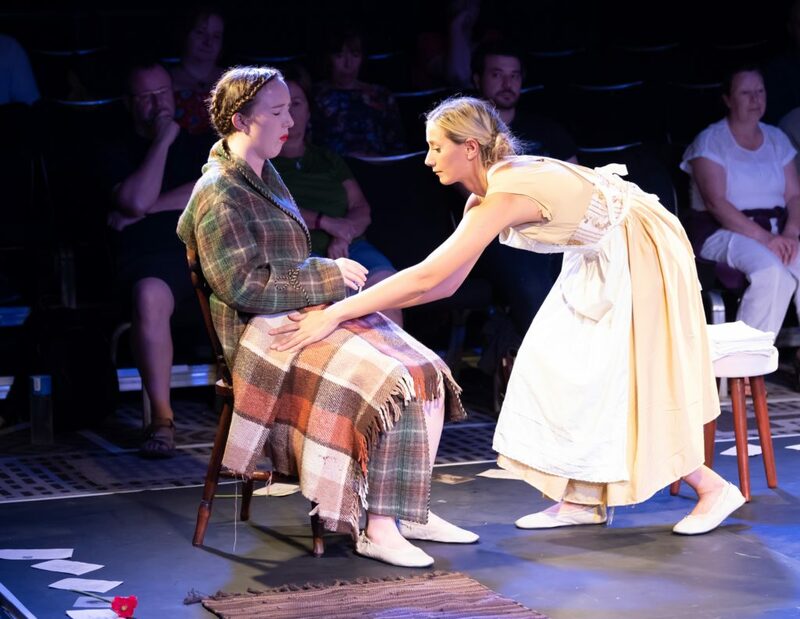 In the programme, the creatives explain that Dear Lucy… is still a work in progress and this is particularly noticeable in the second part of the play, when the emotional impact seems less. Here, we see the young protagonist resolutely getting on with her daily routine, whilst putting on a brave face in front of her family and friends. However touching, the presentation of these events would benefit from a more theatrical dramatization. What really stuck me about this play, though, was the demographic of the audience, which was mainly composed of men and women in their fifties and over. In times when the international political climate sees a return to nationalism, it would be more reassuring to see the younger generations revisiting the blood-drenched memory of the Great War. Marianna, being Italian, has an opinion on just about everything and believes that anything deserves an honest review. Her dream has always been to become an arts critic and, after collecting a few degrees, she realised that it was easier to start writing in a foreign language than finding a job in her home country. In the UK, she tried the route of grown-up employment but soon understood that the arts and live events are highly addictive.